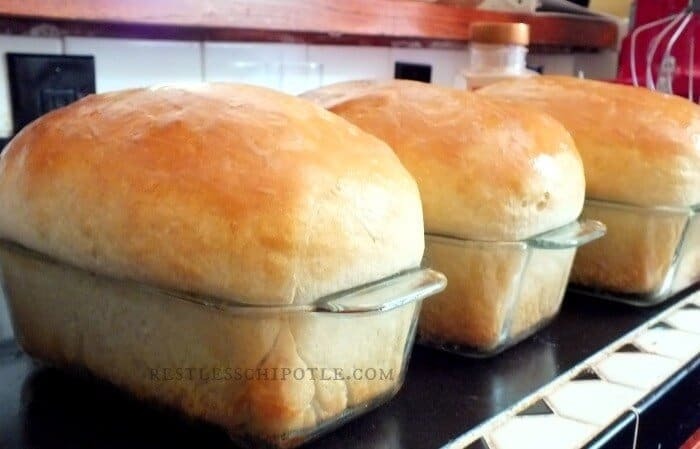 There’s nothing that will make your kitchen smell better than this easy white bread recipe! It’s been tested for decades by busy home cooks just like you and I — and it never fails to be perfect! Soft and buttery on the inside with a crisp crust, this homemade bread has been pleasing families for centuries! Originally published June 2007 – this post has been updated. 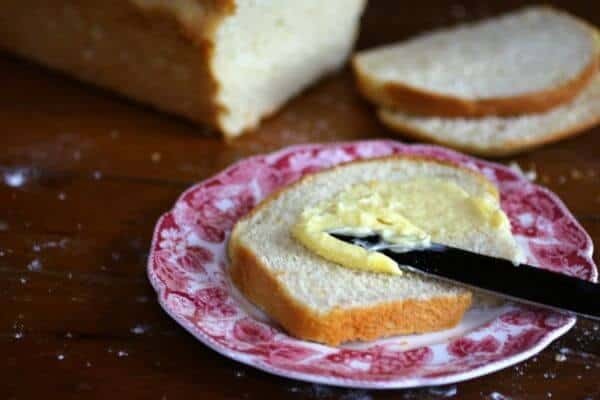 This easy, homemade white bread recipe is one that I have been using since I baked my first loaf at age 13 or so. I promise you that if you take it slow and are careful of the temperature of the ingredients it will come out perfect every single time. This is the perfect recipe for beginning bread bakers of all ages. Nothing smells as good as bread baking! When my dad was alive it was almost like he had an internal radar. I am not necessarily a scheduled kind of person but just about the time I put a loaf to cool on the counter he would knock at my door…The heels were his favorite and I rarely had intact loaf by the time he left. The heels were all gone. Thank God we get to keep our memories even after our loved ones are gone. The are priceless aren’t they?? 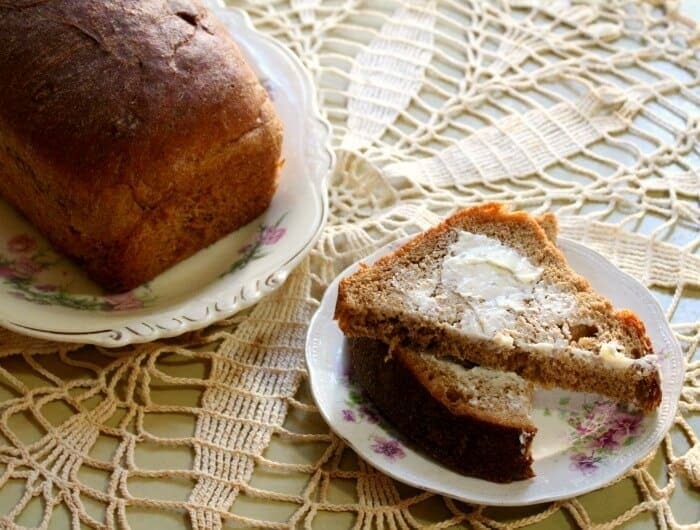 This easy white bread is a traditional recipe, one that is probably very similar to what your grandmother or great-grandmother made. You don’t need to use bread flour, all purpose flour is fine. That means that you can knead it by hand without too much trouble. Each ingredient brings its own little talent to the easy white bread dough. 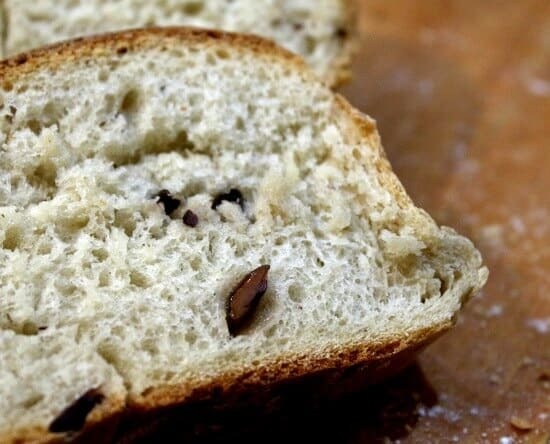 You should never try to vary a homemade bread recipe until you have some experience and understand what role each ingredient plays, as well as how it works with the other ingredients. Flour gives the bread structure and holds the air bubbles that the yeast gives off during rising. Yeast easts the sugars in the dough and gives off a gas. This is what causes the bread to rise. Ginger gets the yeast going. Think of it as the bread’s first cup of coffee in the morning. Milk gives the texture of this bread a delicate softness. Butter helps the crumb stay soft and gives it more flavor. Salt enhances the flavor and keeps the bread from rising too much. A lot of people have asked me how to knead dough properly so I finally did a video to demonstrate the process. I like to buy a large quantity of yeast at one time. It’s much cheaper that way and it will last in a tightly sealed jar in the refrigerator for a long time. You may not think you’ll go through that much but trust me… you will! 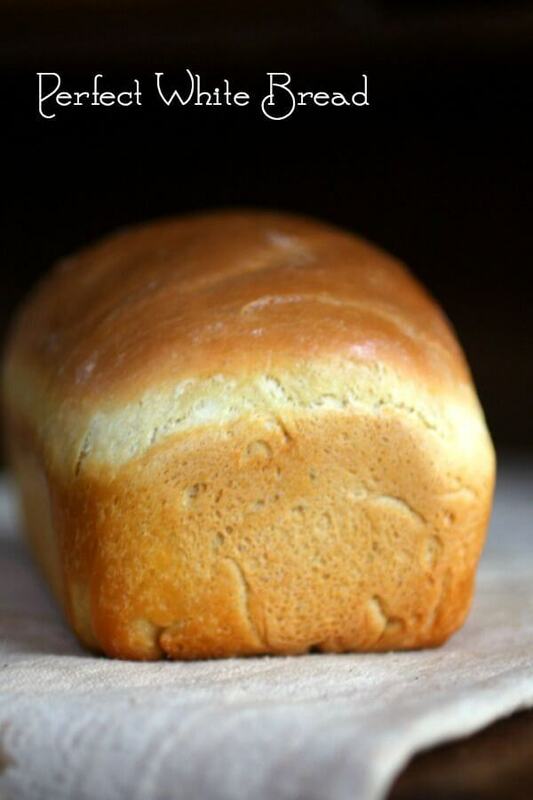 Soft, old fashioned white bread for toast, sandwiches or just hot and fresh, oozing with melted butter. 1/4 teaspoons ginger, it is a yeast activator, you wont taste it. Stir the sugar and butter into the warm milk. Sprinkle yeast, ginger and a pinch of sugar on the water. Stir to dissolve and let it stand until bubbly. Add to milk mixture with 3 cups flour. Beat at medium speed about 2 minutes or stir by hand until batter is smooth. Add enough remaining flour to form a dough that leaves the sides of the bowl. Turn on to lightly floured surface, cover and let rest 10 minutes. Knead until smooth and elastic-about 10 minutes. Round up into a ball and oil all sides. Place in a lightly oiled bowl and cover with a tea towel. Let rise in a warm place until doubled about 1 1/2 hours. (The inside of the oven with the light on is perfect). Cover and let rise again until doubled, about 30 minutes. Shape into a loaf and place in an oiled bread pan. Let rise until almost doubled, and bread is rounded above the pan, maybe 30-45 minutes. Bake at 375 for 30 minutes, or until loaves sound hollow when tapped on the bottom. Cool in pan for 5 minutes, remove from pan, and finish cooling. If a soft crust is desired cover the loaf with a clean tea towel during the cooling process. « Want to Make The Ultimate Mudslide Cocktail? 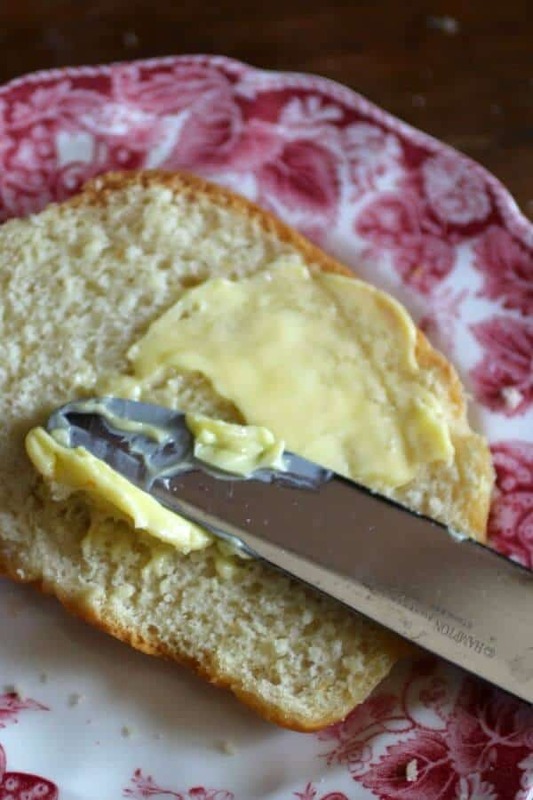 Can regular salted butter be used? sure! You might want to cut back on the salt in the recipe though. When you say sour milk do you mean buttermilk? And you say a lot of sour milk so exactly how much would you be using double of the regular milk? And have you tried it with the buttermilk? I mean sour milk – milk that has soured. The measurement is the same no matter which you use. I have been making my bread for years and love trying new recipes, I will be trying your recipe soon and will let you know how it turns out. Thanks for sharing. My bread turn out really thick on the inside, any idea as why that might’ve happened? It wasn’t baked through and it didn’t rise enough – those are the two most common reasons. How do you warm your milk? On the counter or microwave? I have a question regarding the use of ginger and bread machines. Many bread machines have a difference in their order or putting wet/dry ingredients in. For my particular bread maker, I put the wet stuff first, then salts and sugar followed by the flour. I then make a small well and put the yeast granules there and turn the bread machine on. I am wondering where I should add the ginger, in the well with the yeast or to the water? Has anyone else experimented with this before and would have the answer? I’ve never used a bread machine so I can’t really answer. Sorry. You.mix the ginger wIth the flour. I didn’t see where you added the salt?? I forgot to put it in. I’ve fixed it now..You put it in right after you add the 3 cups of flour. Ooooh…awesome! I have been wanting to learn how to make my own bread! Thank you for this awesome recipe! 🙂 have fun with it! Is the white flower self rising or plain? All purpose flour or bread flour. 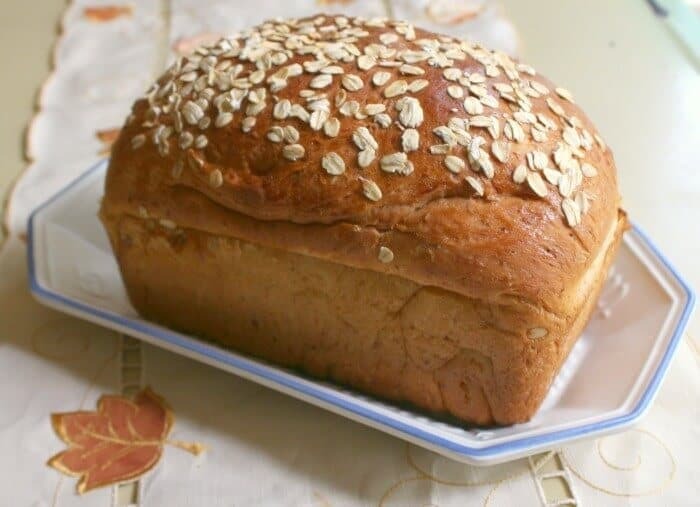 Do you have a Multigrain bread recipe. You “could” use Crisco but I don’t recommend it for a variety of reasons, flavor being one. Why do bread recipes call for sooo much yeast? I used to make 8 loaves at least as big if not bigger than your picture shows, and use 1 tablespoon of yeast. Is the yeast different, or are people just in too much of a hurry to ‘let’ it rise? I suppose it is the time factor. You can certainly use less… I get the best results with this measurement though. How much yeast is “2 pkg”? The photo of your yeast is in a 2lb bag so I’m not sure how much to use. My first ever attempt at baking bread from scratch is rising with the oven light right now! My forearms are killing me from kneading, but it will be well worth it if my loaves turn out well. This just might have to be a new part of my workout! Will update later!!! Oh my goodness! This bread is delicious!!! The first loaf disappeared FAST! Yay! Holly I am so glad you liked it! That is some beautiful bread!